Burnet moths look to me like they are wearing fancy red and black coats! But their sartorial elegance and vivid colouration spell out a clear warning to any would be predator: beware! Eat me and you will regret it! The reason for this warning colouration is that they are poisonous; they contain hydrogen cyanide. They obtain this from their host plants, which contain cyanogenic glucosides. 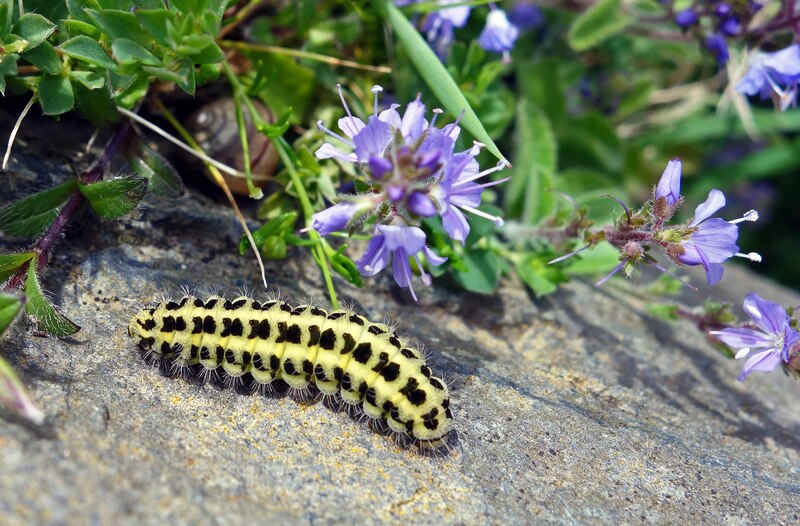 The larvae are therefore, also poisonous, but their warning colours are different: yellow and black (see below). It’s interesting that they adopt different warning colours at different stages of their life cycle. Makes life more colourful! I am not sure what species of burnet moth this larva is. I came across it on Sierra Capelada, a mountain in Galicia, at a height of about 500m. 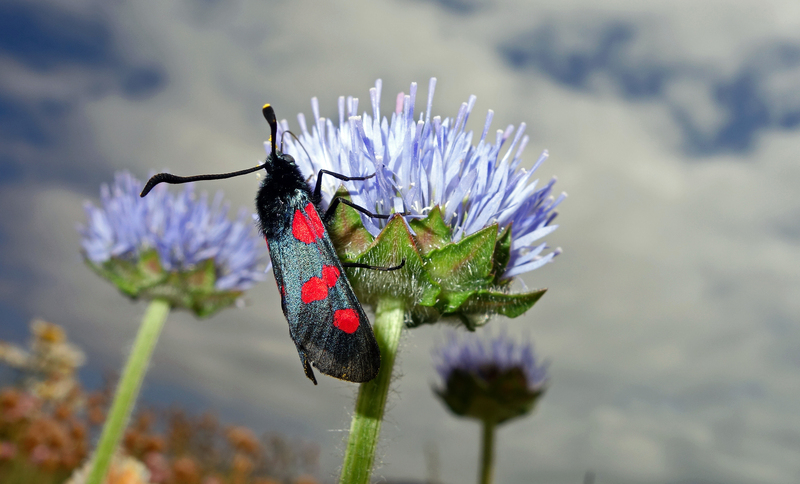 So perhaps it is Zygaena transalpina, but it also looks like Z. trifloii. The larvae are hard to tell apart. Perhaps someone can help? I also struggled to identify the small, purple-blue flowering plant on which it appeared to be feeding. Never mind; if you Google Burnet moth larva and select images, you can have a go yourself! There are also a remarkable number of subspecies of these Burnet moths; one site listed 62 different subspecies of Zygaena transalpina! That’s a serious amount of taxonomic splitting! I took all of these images in Galicia, Spain, but the adults and larvae were from different sites, so they might not be the same species. 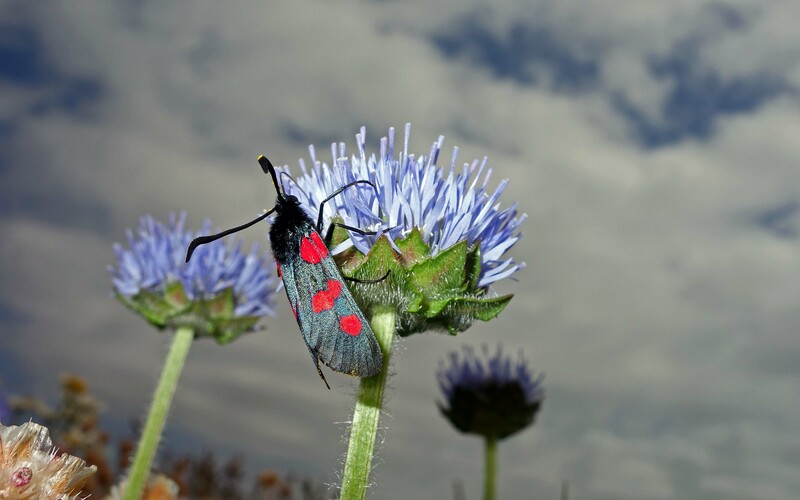 The adults, which look like Five-spot burnets (Zygaena trifolii) were feeding on Sheep’s Bit Scabious (Jasione montana), a very attractive flower that seems to attract a lot of insects (such as Marsh Fritillary butterflies for example). There is a lot of interesting biology to do with how these moths utilise the cyanogenic compounds in their lives, including their love lives! The female larvae can release hydrogen cyanide and the males just love the smell of it! There is a summary of research carried out of one species in another excellent blog (1). 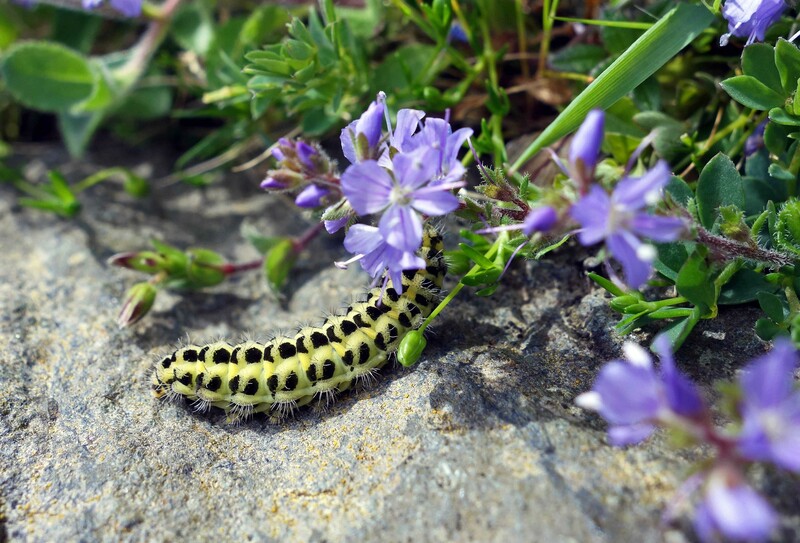 A very good site for European Lepidoptera, including Burnet moths and their larvae is here (2).. Previous Previous post: Little sand digger! Ray Cannon's nature notes Yellow and black larvae; red and black adults; what am I?